Many. And that’s because the patterns of behavior that elicit such thinking are rampant. And what’s the problem with this? The problem is that we don’t quite understand how the body functions—and don’t use that knowledge when it counts. In a four-hour timeframe, energy isn’t fungible in any sense that matters: it isn’t a matter of time until the body runs out of energy. It’s a matter of rate of consumption. The reason that running out of energy is seen as a matter of time—and the reason The Wall is a “reality” of marathoning—is because the paradigmatic approach to running is to consume the body’s common pool of resources with this sort of shortsighted abandon. In other words, there is a systemic structure underlying all of this: a cultural focus on short-term gains (think quarterly report vs. four-decade growth plan) seeps into our athletic dispositions. Then combine that with the fact that Mr. Average Runner started running at 25, and moved into marathoning at 27. There you have someone who, despite his best intentions, isn’t correctly equipped to move away from the quarterly-report kind of thinking that helps him so much at the office. This person isn’t correctly equipped to grapple with all of the physical and physiological requirements of the marathon—and this forces their body into a short-term kind of thinking: survive NOW; consume NOW; worry about the rest later. And when this situation occurs over and over until it becomes the statistical majority, you get an “artifact of thought,” a “thing” that the pattern of thought—in this case short-term thinking—has created. In this case, the artifact of thought is a common experience: The Wall. Because that experience now has a name, and is socially real, you create the situation where people become existentially validated by encountering it: hitting The Wall means that you are a marathoner; you now bear the badge. And I do mean inevitably: at a Systems Thinking workshop, Peter Senge would tell us how he put groups of MIT Sustainability-Lab students through a computer simulation that simulated The Tragedy of the Commons. These graduate-level sustainability students had a 90%-plus failure rate: they all depleted the commons. One of the reasons that this systemic structure is so recurrent is because all of these individual actors mobilize their assets in increasing amounts. The mobilization of those assets means that the actors expect to use the commons at a certain rate. Once the commons crashes, the difference between mobilization and resources creates an “expectation gap,” meaning that the actors have come to expect too much of the commons. 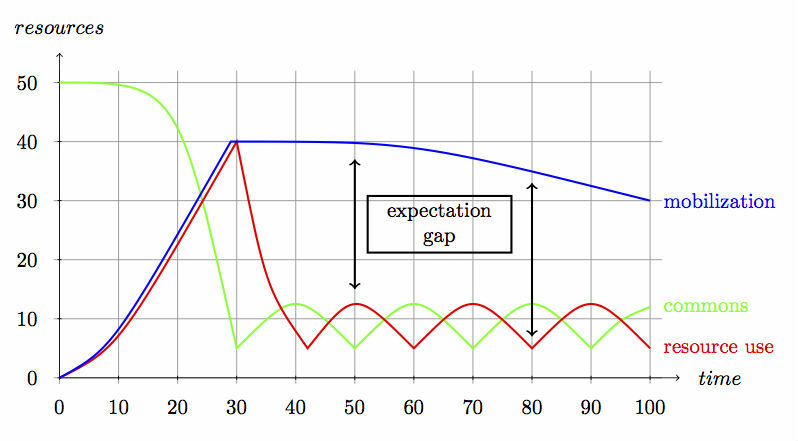 The creation of this “expectation gap” generates the collapse. (You can see how this systemic structure encompasses many of the resource problems our society faces: the depletion of fisheries, peak oil—they’re all examples of The Tragedy of the Commons). But because the actors are all still trying to use the commons, activity and resources tend to oscilliate at a much lower level. This is exactly what happens in the marathon. After hitting The Wall, the athletic output of marathoners decreases drastically, and they are forced into a start-stop pattern until they reach the finish line. Just like on the graph above. While one of the ways to beat this systemic structure is indeed, the time-tested “train your fat burning capabilities,” there’s more avenues to explore than just that. Beating The Wall isn’t just a measure of developing the system to sustain this sort of abuse. The Wall isn’t just an athletic situation unique to marathoners. You see this repeated across a multitude of domains. Strictly speaking, it’s not about athletics. It’s about behavior. Remember: The Wall is an artifact of thought, created by a recurring behavior patterns that are tied to an underlying systemic structure. In other words, the first step is to find a way to change the systemic structure that creates this sort of short-term thinking. The question to ask ourselves is: what does a world look like in which The Wall isn’t real? And what behavior would the system, my body, have to elicit to make that happen? One solution (which addresses the pattern of behavior) is to develop a pacing strategy: the important part isn’t at what speed you suppose you can complete the marathon, but at what speed you are engaged primarily in burning fats. Completing the marathon at the maximum speed possible—safely—is a feat that takes deep knowledge of your particular athletic machine. This is how you develop that knowledge. Think of it this way: you want to run the first half of the marathon conservatively enough that you do a negative split: so that you run the second half faster than the first. At first, that’s going to mean a long marathon; being conservative enough will probably mean running the first half a full 30 minutes slower than usual. But notice that you’re doing more than just developing fat burning. You’re explicitly developing your ability to perceive your resource use. That’s the point. That’s why systems thinking, a management discipline, is so much about empathy and awareness—about all of these skills that seem to have little to do with management. The point isn’t to train to such an extent that your use of the commons doesn’t matter—or that you never developed your anaerobic capabilities. There is nothing but injury in that direction. The efficiency of a system will always be predicated on the efficiency of its management. I’ll say this one more time: the point of illustrating The Wall as an example of The Tragedy of the Commons is to illustrate that this isn’t an athletic phenomenon. It’s a systemic phenomenon. It has to do with the behavior of the system—any system. Change the pattern of behavior, and The Wall will stop being a thing.